If you read yesterday's article about the 7 Hottest Neighborhoods In Tallahassee, then you know that Bull Run Home Buyers are very active right now. 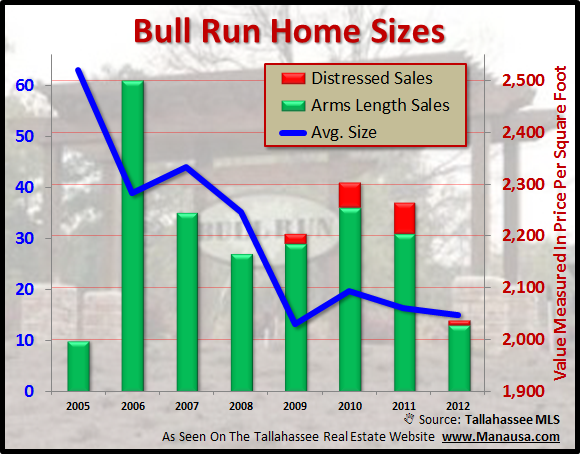 In fact, they are buying homes fast enough to propel Bull Run into the most active position among all Tallahassee neighborhoods. I identified an important trend among Bull Run home buyers last November, and we find that trend has strengthened in the first quarter of 2012. And what trend might that be (for those of you who missed the previous article)? Our first real estate graph shows that Bull Run home buyers are buying smaller and smaller homes every year. As Bull Run is a younger neighborhood, most of the sales thus far have been new construction. I believe this is a sign of builders have to go "smaller" to compete with falling home prices across Tallahassee. Of course, this begs the question, what's going to happen when the normal cycle (5 to 7 years) of re-sales really starts to hit the market in Bull Run? 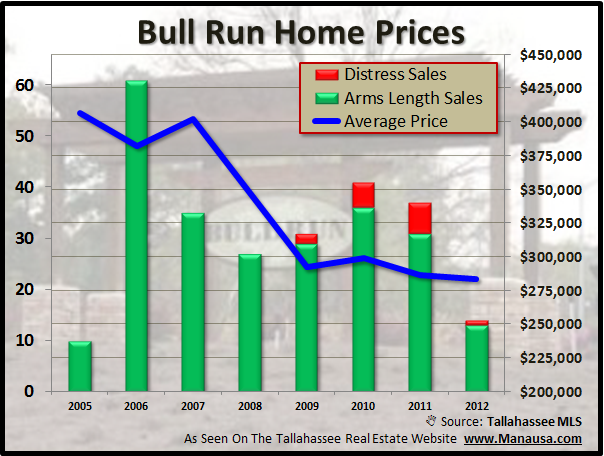 If you are thinking about buying a home in Bull Run, you will be treated with the lowest prices ever seen there. Currently, the average price of a closed home sold in Bull Run is under $284,000. Home values have followed home prices, and Bull Run home buyers are liking what they are seeing. 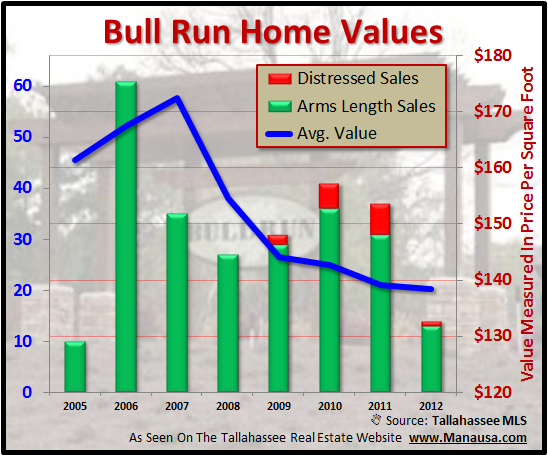 This chart shows that values are falling, but values appear (at first glance) to be done just 20% since the peak of the market... how could this be true when the rest of Tallahassee is down over 30%? Our final real estate graph shows what's really happening in Bull Run. It seems Bull Run home buyers are choosing so much new construction that it is hiding the fact that existing home values have declined significantly. Fortunately for Bull Run homeowners, the decline is better than the market (down 27%). 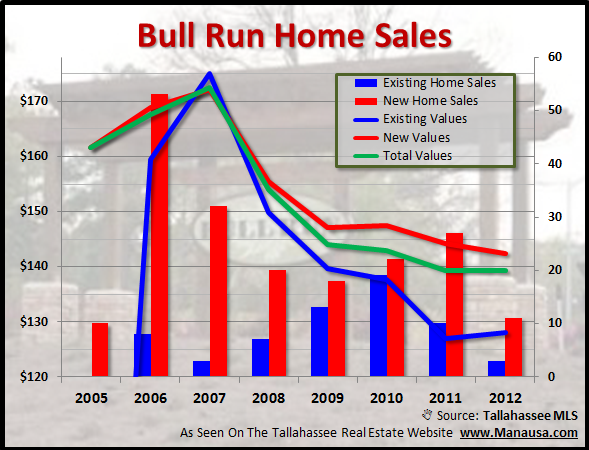 My concern for people who want to sell a home in Bull Run over the next few years is that the supply is going to exceed the norm for Tallahassee. I believe demand for this great Northeast Tallahassee neighborhood will be solid, but the supply side might get glutted when the 7 year itch kicks in. If you are interested in finding out how your home stacks up and whether or not you should sell it this year, just drop me a note and we can schedule an informative meeting that will help you prepare your best housing plan. Remember, Bull Run home buyers are choosing new right now, so the resale market will either have to wait until this cycle is over, or will have to offer significant value over what is being built.